telling you, she's deadly” remarks by Definitely Thursday, resident on page 13 of the fictional novel AFK by resident Huckleberry Hax. Are you one of the many residents of Second Life to have an alternative identity or ALT? Some people have several ALTs serving various purposes. In the novel “AFK”, the members of a Second Life detective agency do a thriving business with assistance from their ALTs. This usage, however, is the exact use of an ALT that most people fear, for deception. This is the belief and the fear of a large majority of residents, that an ALT will be used to deceive them or to bother them in world. ALTs are not the bad guy, it is the user. There are many wonderful ways to use an ALT in world. I have two ALTs, one is a male AVI called Pablo, he does some building projects for me. He doesn’t have friendships. He is for working on projects. In his profile I disclose that he is an alt, how to contact my MAIN, and that I am female. It hasn’t kept me from some very interesting conversations. Just last night while building at the LEA Sandbox a Chilean resident noticed my AVI’s name, Pablo, and that he was named after the poet Pablo Neruda. The resident I was speaking to is a huge fan of Neruda’s work, so much so, he told me he named his son after Neruda. He said he saw that I was a woman so guessed that I was not a ‘Pablo’ irl. I laughed and said he was correct. It was a fun and an engaging conversation that ended with just ‘nice meeting you’. I think Pablo is a good representation of a large number of the ALTs in world. It is only a few who abuse the process that give ALTs a dubious reputation. My second ALT is a female named Stevie. I do not identify her as an ALT as of the writing of this article. I made her to perform tasks for my MAIN without interruption from well meaning friends. She is an alternative to my MAIN. I use her to explore areas my MAIN avi does not, such as roleplay. I don’t use her much in world. Most of my close friends know about her, and she is friends with some of their ALTs. ALTs, or alternative identities of the same person, easily spark conversation as everyone has an opinion. Second Life Wiki’s definition reads “an account used by a resident for something other than their usual activity or to do things in private”. As I wrote in the beginning of this article, what residents seem to fear most about ALTs is deception. Some have also used ALTs to harass or to stalk others. Nefarious uses that will get not only the ALT banned, but the MAIN as well. ALTs are not secret identities to Linden Labs they can identify ALTS from collecting our IP addresses when we log into SL. It is this practice that helps Linden to locate and ban MAIN accounts along with all ALTs of a user who violates the TOS/CS of SL. In the recent years LL has added an area specifically identifying the account polcies of ALT personas. 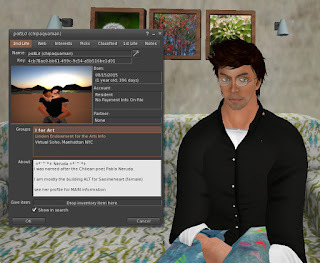 In SL’s Community Standards Policy under Disclosure the privacy of someone who is in an ALT is protected by the same privacy standards as a MAIN AVI. In my group of friends having an ALT is no big deal, and most of us know the identities of our friends ALTs. I asked my Facebook friends about ALTs and was not surprised at what a nerve this touched in many residents. Most of the people who replied to the FB post had one or two ALTs and listed many practical uses for their ALTs. Without exception, each person responding emphasized that ALTs should not be used to deceive or to bother other people. The reputation of ALTs as possible trouble runs deeply among residents. Do you need to identify ALTs when you are in world? Blogs are ripe with information on how to identify an ALT in SL if you choose to do so. However, it is important to remember, “it is impolite and against the TOS/CS to reveal an alternate account if the owner of the alt has not done so themselves. Accusing another resident of being an alt is also impolite.” Whether an AVI is an ALT or not is not the most important question. How they behave as a user is the more important question. What is more critical is not whether you have met an ALT or not at your favorite nightspot, but if the person you are talking to makes you feel uncomfortable for any reason. If this is the case, take the same precautions you take with any AVI that you don’t want to interact with, mute them. If the AVI violates TOS, report them. Being an ALT does not make someone less desirable to interact with, being inconsiderate does. Consider how you use your ALT in world, and treat everyone as well as you would inside your MAIN. If we all do that, then lives should be just fine in SL.